Steak is one of those things that intimidates a lot of people but really shouldn’t. If you’ve ever struggled with cooking the perfect steak, this list of tips should help. We’ve turned to some of our favorite Food Network personalities and more celebrity chefs for their steakhouse-worthy cooking methods. 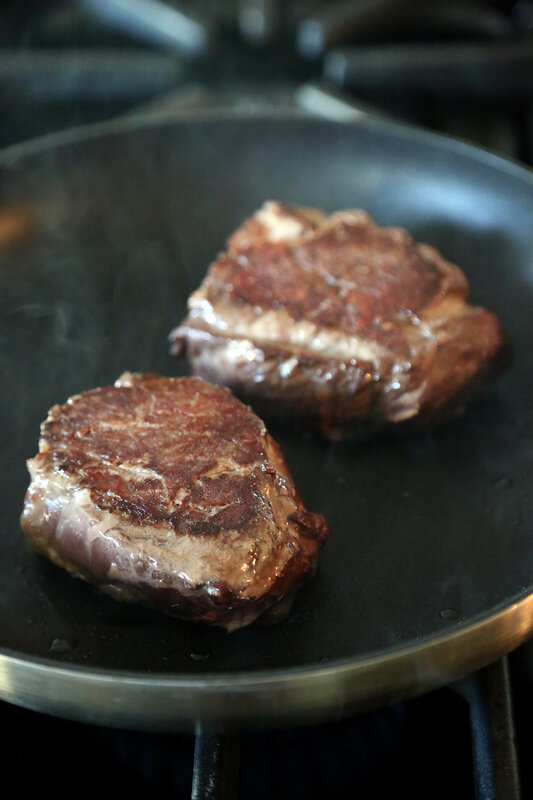 For pan-seared rib eyes, Alton Brown recommends two key things: bring the steak to room temperature (it cooks quicker this way), and heat a cast-iron skillet in the oven while the oven heats to 500 degrees. He doesn’t use the oven until the steaks have been seared first, but heating up the skillet before putting it on the stove helps get the process started and ensure a completely heated-through pan. Giada’s Tuscan rib-eye steak recipe proves everything is better with Italian flair. If you’re into rosemary, thyme, garlic, and lemon (who isn’t? ), this is the best way to cook your steak. Chrissy Teigen admits in her cookbook, Cravings, that she’s normally a traditionalist when it comes to steak (page 206), but her husband John Legend’s “best marinade in existence” changed her mind. A lot goes into it — soy sauce and garlic, for starters — and after marinating for eight hours, you’re on your way to juicy, flavor-packed steak. “I would probably still go simple if I was staring at the most beautiful piece of beef I’ve ever seen, but use this tangy marinade on a nice, solid rib eye, and I promise you, it will be hard for you to have it any other way,” she wrote. Bobby Flay, master of the grill, doesn’t bother with anything complicated for his perfectly grilled steak recipe. All you need is steak, oil, and salt and pepper — and Bobby always recommends oiling the meat itself, not the grill or pan.